Ancient Egypt comes to life on this perfect introduction to the world’s oldest travel destination. Ancient Egypt comes to life on this perfect introduction to the world’s oldest travel destination. Explore the highlights of exotic Cairo in the company of an expert Egyptologist immersing yourself in history both ancient and modern. 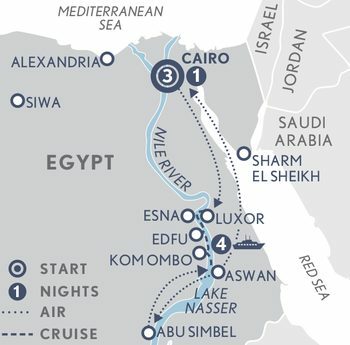 Discover the dazzling temples and ancient tombs along the river on a luxury cruise between Luxor and the southern city of Aswan aboard the newly refurbished Sanctuary Sun Boat IV, one of the finest small ships on the river. Receive a warm A&K welcome on your arrival into the Egyptian capital and transfer privately to your luxury hotel on the banks of the River Nile. Spend time orientating yourself with a leisurely walk around the tree-lined streets of the Garden City neighbourhood, admiring celebrated local artworks in the lobby or simply meandering along the waterfront Corniche. Wander through 7,000 years of history accompanied by your private Egyptologist at the Egyptian Museum of Antiquities and uncover the treasures of Tutankhamun and the Mummy Room. Designed by the French architect Marcel Dourgnon, the Egyptian Museum is home to more than 120,000 ancient artifacts including the funerary mask of Tutankhamun made from 11kg of solid gold, discovered by Howard Carter in 1925. Cairo has so much more to offer: ancient monuments, glittering mosques, imposing citadels, a labyrinthine bazaar and old Coptic churches. This afternoon, choose a walking tour of Islamic Cairo and an adventure in the Khan El Khalili bazaar; or a visit to old Cairo including the Coptic Museum. Journey south of Cairo to the necropolis of Saqqara and the impressive Imhotep Museum located at the foot of the complex. In addition to the famous Step Pyramid of Djoser, (also known as Saqqara Pyramid), and the step tomb built during the reign of the Third Dynasty, Saqqara is home to different monuments and burial sites. There were 16 royal pyramids here and some still remain. The Imhotep Museum houses relics from the Saqqara area including a Ptolemaic mummy discovered during the excavation of the Pharaoh Teti's pyramid complex and a large double statue that was found near the causeway of the Unas complex. The statue depicts the 19th Dynasty High Priest of Mut, Amenemopet, and his wife. Continue to the 4,500-year old Pyramids of Giza, built for Pharaohs Cheops, the oldest and largest, Chephren and Mycerinus, the smallest. The Great Pyramid of Giza (Pyramid of Cheops) is the only one of the Seven Wonders of the Ancient World still in existence and you’ll have privileged access into the tomb. Just to the east lies the legendary Great Sphinx rising from the Giza plateau. Having inspired the imaginations of emperors, poets, artists, scholars and travellers for centuries, it remains a truly enigmatic feature of Cairo. Continue to the Solar Boat Museum to view the re-assembled funerary boat of King Cheops, one of the most important archaeological finds in Egypt since the Tomb of Tutankhamun. Set off on your morning flight south to Luxor where you are met and transferred to the private riverside dock to board Sanctuary Sun Boat IV, your luxurious home afloat the River Nile. Upon arrival, you have an opportunity to visit the strikingly, graceful Temple of Luxor. After lunch on board, join your Egyptologist on a tour of the West Bank of Luxor to explore the Valley of the Kings, most famous for the tomb of Tutankhamun, with its legendary treasures, discovered by Howard Carter in 1922.2 There are 63 tombs here, with different ones open each day. You also have the chance to visit at least one tomb in the Valley of the Queens and visit the Temple of Queen Hatshepsut. On your way back to the river pass by the famed Colossi of Memnon, the two massive stone statues of the Pharaoh Amenhotep II. This evening on board enjoy drinks, dinner and a cultural performance. After breakfast on board, begin your day with a visit to the Temple of Karnak, the world’s largest religious site. Spread over 200 acres, this complex of ruined temples, pylons, sacred lakes and chapels is breath-taking and an insight to the extraordinary achievements of the pharaohs. Lunch is served in the lounge whilst you sail to Esna. After lunch, explore the Greco-Roman Temple of Khnum at Esna. The beautifully-preserved Great Hypostle Hall was built during the reign of the Roman Emperor Claudius; it was excavated from the silt that had accumulated through centuries of annual Nile floods and is about nine meters lower than present-day street level. Back on board enjoy afternoon tea and later dinner as the ship cruises to Edfu. Following breakfast, explore the extraordinary Temple of Horus, one of the best-preserved shrines in Egypt. To reach the temple, board a horse drawn-carriage through town. Back on board, lunch is served as you cruise to Kom Ombo. Venture ashore to the Temple of Kom Ombo, dedicated to the crocodile-god Sobek. The temple stands at a bend in the Nile where, in ancient times, sacred crocodiles basked in the sun on the riverbank. Later, afternoon tea is served in the lounge and you have the chance to take part in an Egyptian cooking lesson as you sail to Aswan, a bustling market town in the south. Tonight, an Egyptian themed event is planned on board with traditional entertainment and local cuisine. A breakfast buffet is served on board and the morning is at leisure. After lunch, board a motorboat for the short ride to the Island of Agilika where you visit the majestic Philae Temple, a beautiful shrine dedicated to the goddess Isis, which was rescued from the rising waters of the Aswan Dam in the 1960s and rebuilt stone by stone on higher ground. Next stop is the Granite Quarries, which supplied the ancient Egyptians with most of the hard stone used in their pyramids and temples, here you will also see the Unfinished Obelisk, located in the northern region of the stone quarries. You will also have a chance later today for a short cruise on a felucca (a typical Egyptian sail boat) around Elephantine Island, Lord Kitchener’s Botanical Gardens and the Aga Khan Mausoleum. Tonight, there will be a farewell dinner. Disembark this morning and before returning to Cairo, a short flight takes you to one of Egypt’s most awe-inspiring sights – the colossal temples of Ramses II and Queen Nefertari at Abu Simbel. Built by Ramses the Great on the edge of his empire to impress his might and power upon all those entering Egypt through the southern border, these massive temples were moved stone by stone in 1964 to higher ground to escape the rising waters of Lake Nasser. Following your visit fly back to Cairo where you are met and transferred to the hotel with the rest of the day at leisure. Bid farewell to Egypt and transfer to the airport for your onward journey.